The Mitchell Report will not end steroid use any more than a nuclear bomb will end warfare. The names named are at worst little surprise and best documentation of what the court of public opinion already concluded. The Report feels like a letdown, not necessarily for its content, but simply because it has arrived, its mysteries laid bare and its prescriptions so logical as to lack intrigue. Then again the last thing the game of baseball (hell, the business of baseball) needs is more intrigue as it relates to rule-breakers. In a way, it’s a bit like New Year’s Day for baseball. There has been a constant and near unprecedented firestorm of expectancy for the Mitchell Report exceeding even the infamous 1989 Dowd Report which helped to consign Pete Rose to sad paid autograph sessions with his graying admirers. And now, with the facts published and the findings official, we as fans are now left to…do what, exactly? Rue what was and forget the memories of McGwire? Wish for what could have been? The Steroid Era Every team had a player or two (at least) who was hit. The answers produce more questions, very few of which ultimately matter in determining the legacy of the last decade of baseball. If every group’s got a couple cheaters, you’re left accusing one team of cheating more, probably not the best course of action. The sleeping dogs were awakened, shaken around, and now left to lie again. The majority of the names on the list are no longer in baseball. David Segui, Dave Justice, Mo Vaughn, Rondell White, and Lenny Dysktra are but some of the men whose legacies will not evade the taint of drug abuse, even if their careers did. The ageless Roger Clemens, by far the biggest name on the list, will almost certainly retire now, his marketability as a free agent wiped out, his case bloated and not worth the trouble. It remains to be seen whether he will ascend the mountain with Walter Johnson and Warren Spahn or sink into the muddled morass of a Rafi Palmeiro. More fascinating to me is the fact that every fan base he has had in professional baseball loathes him for a different reason: Boston (obvious), Toronto (jumped town to win a ring), New York (unretired to sign w/Houston, plus probably dragged Andy Petitte down with him), and Houston (no-showed ’05 WS and now a black sheep favorite son). Of course the BALCO Boys had their day in the sun. Little more needs to be said about the gym from hell except that the San Francisco Giants do not look good. GM Brian Sabean had knowledge in 2002 that Barry Bonds’s trainer Greg Anderson was giving steroids to Bonds’s massive orb. He knew this because Victor Conte told him. And yet he did nothing. He remained quiet. The Giants had a new park, the team was barreling toward a World Series (C Benito Santiago is also on the list), and fans were pouring into the Bay Area to get a gander of the great #25. Why mess with a good thing? Who’s gonna know? Perhaps the audacity of those involved correlated directly with the surging negative public whisperings. If they think he’s already on the juice, why take him off the juice? More than likely, Bonds just didn’t care. Bonds, Mark McGwire, Miguel Tejada (who was sold for five bags of Sun Chips to Houston a day before the press conference), and others can now read all about themselves. The report was of course released at a gala ball yesterday. (Normally I link a lot, but let me just give that for you.) Bud Selig’s attempt to sweep the distorted memories of the 1990s under the rug ended with a full-out live press conference in front of national television cameras and an excruciatingly detailed 311 page stone tablet. Thou shalt not hide. It was perversely exciting, a McCarthy moment in a good way; not one of the names on the list had not, nor was not, nor ever won’t be a cheater. The comeuppance is deserved though the punishments may ultimately be lacking. 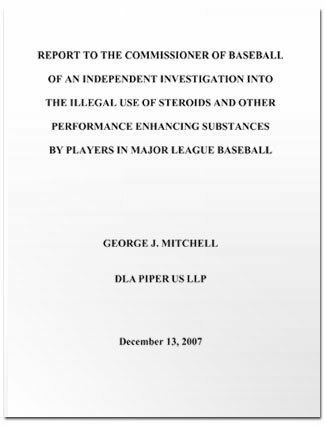 Bud Selig stated later that Mitchell’s report “Is a call…to action. And I will act.” He plans on an early 2008 HGH summit to better establish a way to track the invisible performance enhancers and more thoroughly investigate users. He may as well clean the barnacles on the Titanic. Every swing of the home run derby that “saved” baseball after the 1994 strike was predicated on disingenuous lies. The management and union covered their faces against evidence that required only a naked eye; even the fans consciously accepted what they were seeing without raising their voices (Brady Anderson owes everyone money). And now we have a leadership working on a comprehensive plan for the 2010s to save the 1990s. Wonderful. Selig, Gene Orza, and the rest of union and management hierarchy are swinging too late on a soaring fastball. All they can do now is trudge back to the dugout and wait for next at-bats.